Jack Conway and his supporters are involved in a cover-up and an attempt to obstruct justice, but this does not seem to be on the corporate media’s radar screen. Stengel is hardly a neutral party. In fact, he is a Jack Conway supporter. “According to Fec.gov, Mr. David Stengel has donated $500 to Jack Conway’s campaign in the past,” writes CapitalistBanner.com. “Do we really want a former Jack Conway donor overlooking this?” Or more pt the point, engaging in a cover-up as Jack Conway attempts to beat Rand Paul and become the next senator from Kentucky. Louisville attorney Scott Roby is also as Conway supporter. Roby told Matthew Conway that the cops were investigating him for either drug use or trafficking, thus allowing him to avoid a police raid. LMPD Detective Scott Wilson had told Roby about the investigation. Conway and Wilson both attended St. Xavier High School at about the same time and are longtime acquaintances, according to the newspaper. Scott Roby donated $1250 to the Conway campaign. But it gets worse. It turns out that a Jack Conway supporter, businessman Charles Alexander, was the man who overheard cops talking about the Matthew Conway case in a downtown Louisville restaurant. The narcotics detectives described Matthew Conway as “dirty” (corrupt). Alexander called Jack Conway and informed him of the overheard conversation. 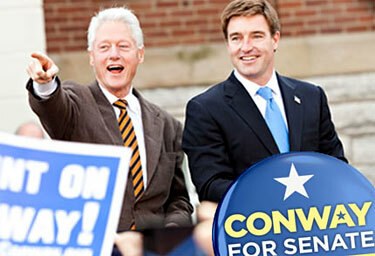 “According to Fec.gov, Charles Alexander is a $2400 donor to Jack Conway and a $4600 donor to Barack Obama, so there is little doubt Mr. Alexander was concerned about the troubling allegations,” notes CapitalistBanner.com. Jack Conway and his supporters are involved in a cover-up and an attempt to obstruct justice, but this does not seem to be on the corporate media’s radar screen. Instead, we are harangued with absurd stories about Rand Paul, Aqua Buddha, and a fraternity prank invented by an anonymous woman. Jack Conway is involved in a brazen attempt to cover-up a police investigation of his brother. Supporters of his political campaign facilitated obscuration of justice. Is this the sort of man the people of Kentucky want representing them in Washington? In the name of objective journalism and fairness, the corporate media needs to cover this story immediately instead of inventing new ways to tear down the Rand Paul campaign.